I’ve just spent some time looking over my past several Discworld reviews. And my memory matched the apparent reality, which is that Wyrd Sisters is definitely the first one that I’ve liked almost without reservation. It is notably the first one since Mort (my previous favorite) that lends itself to thoughtful examination and analysis. Also, it marks the first book to be populated with characters that seemed real and interesting to me right from the start. The titular witches, who have recently formed a coven at the dreadfully modern urgings of their youngest member, are accidentally embroiled in politics when the infant heir to the throne of Lancre is deposited at their feet by loyalists fleeing from the scene of the king’s recent murder. They immediately deliver the child to a troupe of actors passing by, by way of removing the political odor as quickly as possible, only to discover that the duke who has taken the throne is bent on ruining their lives anyway. At which point, it’s time to get the heir-turned-actor back onto his rightful seat by any means imaginable. Plus there’s a lot more and a fair bit funnier that I can’t easily shoehorn into a paragraph of plot description. I was definitely moved to laughter aloud now and then. But as I said, the depth was the best draw for me. On the surface, there are glaring parallels with Macbeth, Hamlet, and the actual life of William Shakespeare, all used to the comedic effect for which Pratchett is justifiably famous. But, and speaking as quite a fan of the Bard, the most interesting piece by far was the witches themselves. 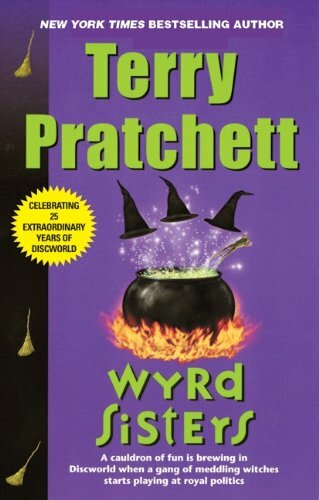 I’ve only ever heard ‘wyrd’ in the context of witches and fortune tellers and the like, and I thought I knew that it meant something generally pertaining to that kind of job. To my surprise yesterday, wiktionary defined it as ‘fate’. Which fit very well in that the witches, despite their best efforts, are being forced to take a hand in the destiny of the entire kingdom, if only to maintain their own reasonably comfortable lives. But it fit far better as and pulled sharply together for me what a profound (if unconventional) fit they are for the Fates. Magrat the newly confirmed Wiccan, painfully naive in the ways of the world, eager to be accepted by her sisters, and entangled in a hilarious romantic subplot, is clearly the Maiden. Nanny Ogg can hardly go two sentences without reference to one of her seemingly infinite brood, and she’s as bawdy as they come. And Granny Weatherwax, despite not seeming to be old enough for the role, definitely contains the no-nonsense attitude, certainty of her own superiority in all things, and barely held-back ire that… okay, these qualities are not automatically what I would have expected from the Crone before today, but they work so very well that the urge to say I did is almost overwhelming. All of which to say this: in addition to being as funny as he’s been yet and providing his best characters yet, this is the book where Pratchett became not just funny, but also very clever in subtly high-brow ways. I don’t think he’s quite where I expect him to be on coherent plotting, but the odds and ends that seemed off to me are partially explicable by the oddness of his world, certainly less glaring than in some previous volumes, and for the most part have already faded from my mind, replaced by everything I was happy about. So they can’t have been as bad as all that. Okay, not just; more like several hours ago. It’s not like you’d ever find out, or even know the difference. But I could never lie to you, baby, you know that. This entry was posted in Words and tagged Discworld, fantasy, humor on June 2, 2008 by Chris.